Valentine’s Day in Japan is a very different celebration compared to overseas, as only women are expected to give gifts of sweets or chocolate on Feb 14 (with a return gift from men a month later on White Day), and not only to the object of their affections, but to male and female colleagues and friends as well. These so-called giri choco, or obligation chocolates, have become a controversial topic in recent years, with chocolatier Godiva ruffling feathers with a full-page newspaper ad last year, asking Japan to reconsider the unusual, and often stressful and costly, practice. However, Yuraku Confectionery Co, the makers of one of Japan’s most beloved chocolate brands, Black Thunder, has always been a staunch supporter of the giri choco tradition. Since the mid-’90s, the company has been promoting Black Thunder as the perfect giri chocolate for Valentine’s Day, pointing out that the tasty but unpretentious chocolates (usually priced at less than 100 yen are a great way to show your appreciation without having anyone mistake it for a declaration of true love. In Japan, Black Thunder has become so synonymous with giri choco that our reporter couldn’t fathom a Valentine’s Day without it. Lost for words and confused by the headline, he read the details on the leaflet, which had been produced by Yuraku Confectionery, to find out exactly what was happening. Every year, Black Thunder gets its own pop-up shop ahead of Valentine’s Day, selling giri-choco related products at Tokyo Okashi Land at Ichibangai inside Tokyo Station. This year, the pop-up shop will be appearing again at the same location until Feb 14, but this time there is a twist. This mysterious alien arrival at Black Thunder’s pop-up store suggests a very different theme for this year’s Valentine’s campaign. Reading further into it reveals this statement from the president of Yuraku Confectionery. This was a pretty shocking statement from the self-styled “King of Giri Choco”. In fact, this anti-obligation-chocolate sentiment was similar to Godiva’s standpoint on the issue last year, which Black Thunder vocally opposed. So this year, instead of their usual giri choco pop-up store, the company will be going in a different direction, with a shop that sells regional-exclusive souvenir Black Thunder varieties instead. Still, we can’t help but think this might all be a clever marketing plan to make customers think about a world without giri choco. In Japan, it’s customary to bring back sweets as souvenirs for colleagues and friends after going on a holiday or business trip, so this sense of obligation exists year-round in Japan, not just on Feb 14. By selling souvenir chocolates instead of their usual giri choco specials for Valentine’s Day, Yuraku Confectionery is essentially just swapping out one type of obligation chocolate for another. And if we’re going to frown upon one type of giri choco, should we abolish them all? -- Survey reveals Japanese men really want home-made chocolate, but are women willing to make it? I can't stand the whole giri thing in Japan. People doing what they perceive as obligation ( excepting working to earn a living ) without really wanting to do it. If you're doing something grudgingly, without wanting to do it, then don't do it. Oh the nerve of this company!!! 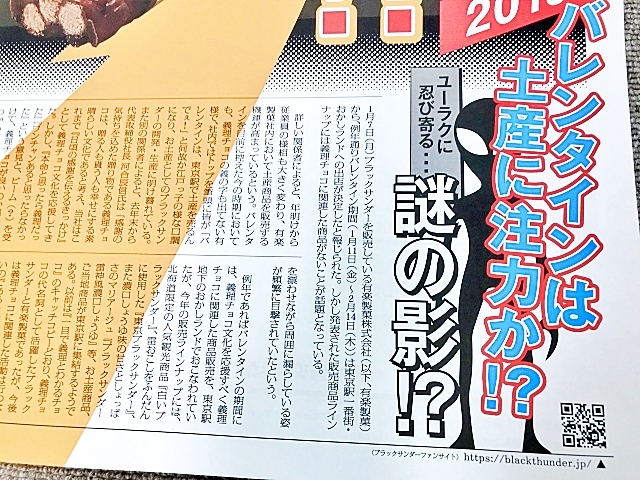 They just wanted to branch out and maybe improve their image instead of pigeon-holing themselves as "cheap giri choco" using a parody of tabloid news to do it. Regional souvenir varieties are like a KitKat thing, right? Sounds like they're trying to get into that market. Black Thunder is great as it is though, I especially like the ice cream bar.